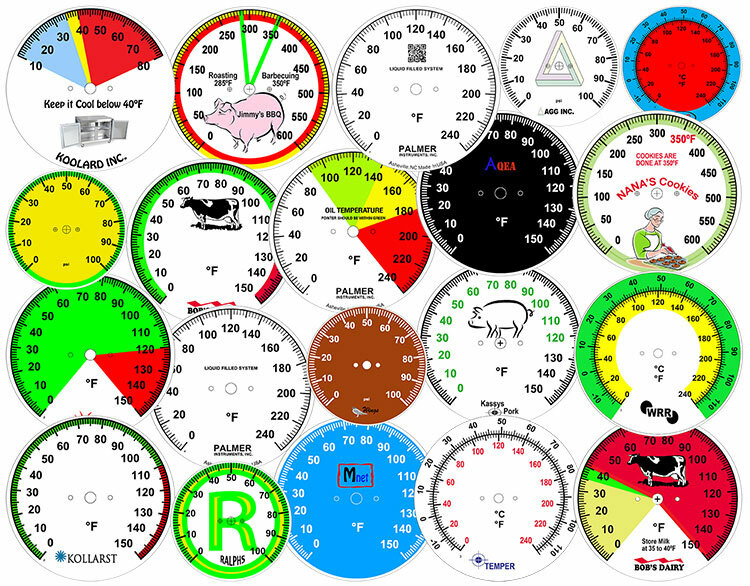 Need a Custom Dial Face? Whatever your requirements, Palmer Wahl can do it! contact info, multiple scales, measuring units, - any indication you require. Contact us with your artwork or idea, and we can create it! 2", 2.5", 3", 4", 4.5", 5", and 6". • Custom logos and artwork. • Company name, slogan, service, instructions, etc. • Your choice of Fonts: A wide variety of different fonts and sizes can be used for better viewing or special effects. • Mark with your Part numbers, QR Codes, SKU’s, or Bar Codes. • Single and dual scales, outer scale (primary) and inner scale (secondary) each showing different unit of measurement and graduations, including metric. • Sectors, bands, or lines using an unlimited array of colors. • Indicate a danger zone or warning instructions. Available for liquid-filled and dry pressure gauges. Available on new or repaired instruments. Design and Imprint charges may apply. Call 1-800-421-2853 or e-mail us for information to order.